bed bug extermination in Las Vegas call 702-586-5179. Read how we can kill bed bugs with heat treatment in just one day. Read more about bed bug extermination options here. K-9 Sweeps LLC is available 24 hours a day, seven days a week, by appointment, to meet the discreet and essential service elements required by our most valued clientele. K-9 Sweeps LLC is headquartered in Las Vegas, Nevada and delivers fast, effective service to the surrounding areas. We absolutely love what we do and look forward to designing a program to serve your unique situation. It is our belief service is not just about locating Bed Bugs. It is about a responsible approach, innovative solutions and most of all, happy clients! Price should equal perceived value and service should be conducted at times most convenient to our ultimate boss, the client. K-9 Sweeps LLC guarantees to arrive at your site with a clean, healthy, discreet and meticulously trained Bed Bug Detecting Canine. Each K9 has received over 600 hours of proactive Bed Bug detection training prior to arriving at our Las Vegas location. Our Bed Bug dogs are tested every day on a scent discrimination wheel, simultaneous to actively seeking Bed Bugs at our training facility. Our handlers are trained along with the Bed Bug sniffing dogs and learn to work with the canine as a team. Canine detecting Bed Bug teams are proven to be over ninety percent accurate. 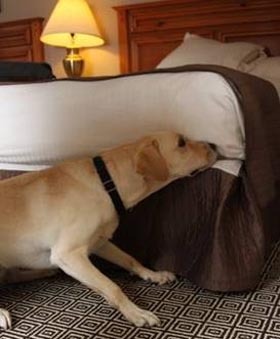 Bed Bug sniffing canines are incredibly efficient and can “sweep” a room in a matter of 3 minutes. Our Bed Bug detecting canine team will check in with your designated contact person. After reviewing what rooms or situations require our attention, the k9 team will embark on its “sweep” of targeted rooms. It is customary for an agent of the client to accompany the Bed Bug sniffing canine team. This person can provide access to rooms and arrange any assistance the K-9 Sweeps LLC team may require. Our targeted list should include list of rooms to be “swept”, suspected areas of Bed Bug infestation, rooms adjacent to Bed Bug infested rooms and areas with a history of Bed Bug activity. Each room will be examined in a matter of 2-3 minutes. Special attention will be given to areas that traditionally harbor Bed Bug infestation. These areas include behind a bed headboard, night stands inclusive of lamps, clock radios, telephones, mattress, box spring, bed frame and carpet edges around baseboards where the host sleeps. If the Bed Bug k9 team “alerts” to the presence of Bed Bugs, our dogs are trained to signal in a very quiet and discreet manner. Our Bed Bug dogs do not bark, scratch or jump. Daily cage training assures the canine remains quiet. When the canine team “alerts” to Bed Bug activity we suggest the room be taken out of service immediately and be prepared for treatment. Adjoining rooms should be made available for inspection. Depending on your service program K-9 Sweeps will document all our findings, in some manner, for your review. If your property was “alert free” K-9 Sweeps LLC will issue a certificate stating as such. K-9 Sweeps LLC offers four service programs designed to satisfy any situation we may encounter. This program is designed to meet the needs of a residential client who suspects a Bed Bug infestation in their home and is interested in identifying the source. Commercial prospects that desire a “one time sweep” or confront an emergency situation may also employ this program. This service is billed at an hourly rate. This program is ideal for facilities that are averse to a contractual commitment or opt for a less comprehensive program. Sweeps can be targeted in nature or comprehensive as dictated by the situation at hand. This program can be tailored to meet a tight budget and allows for flexibility. Clients that have varied needs and facilities will embrace this program. Program billing can be hourly or a per room charge depending on your needs. Special rates for SPOT SWEEPS are included in this service. This is ideal for a commercial client that wants to synergize their existing integrated pest management program. It requires a contractual commitment to “sweep” the facility regularly. Clients are guaranteed a 48 hour response time for emergency situations. An onsite log book is kept at the facility documenting all activity. Clients have access to our daily training regime and can be confident we stay on top of our game. This service is billed out as a per room charge. Emergency SPOT SWEEPS are conducted at a reduced rate. Our premier program catering to a facility recognizing the importance of protecting their brand against Bed Bug infestation and simultaneously desires a contractual commitment. K-9 Sweeps LLC is on site to conduct Bed Bug training seminars for staff member’s semi- annually. Reporting technology involves bar code scanning and a very high level of documentation. All bar code reporting methodology is accessible by our client via the internet. These reports have been essential components to Bed Bug litigation cases. Our most valued clients are guaranteed a 24 hour response time and are able to check and pay invoices online. This service is billed out as a per room charge with a set up fee for bar coding technology. SPOT SWEEPS are conducted at a drastically reduced rate.